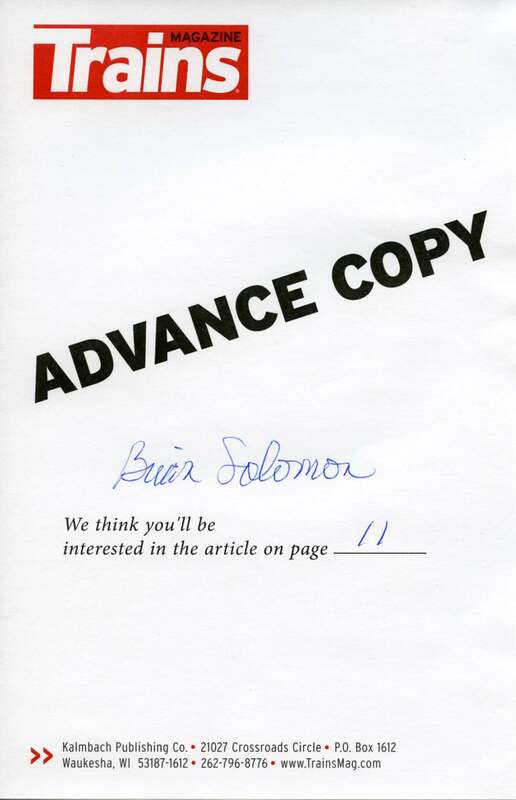 Today, Friday December 7, 2018, Trains Magazine released Episode 11 of my podcast Converstions with Brian Solomon. Bob Bentley of Massachusetts Central is my featured guest in an interview conducted at the Palmer Public Library in Palmer Massachusetts. Bob Bentley with Massachusetts Central’s NW5 at Palmer, Massachusetts in 2008. Brian talks with rail industry veteran Dan Bigda about issues in the industry and, specifically, the railcar supply business. This is the first in a multi-part conversation. 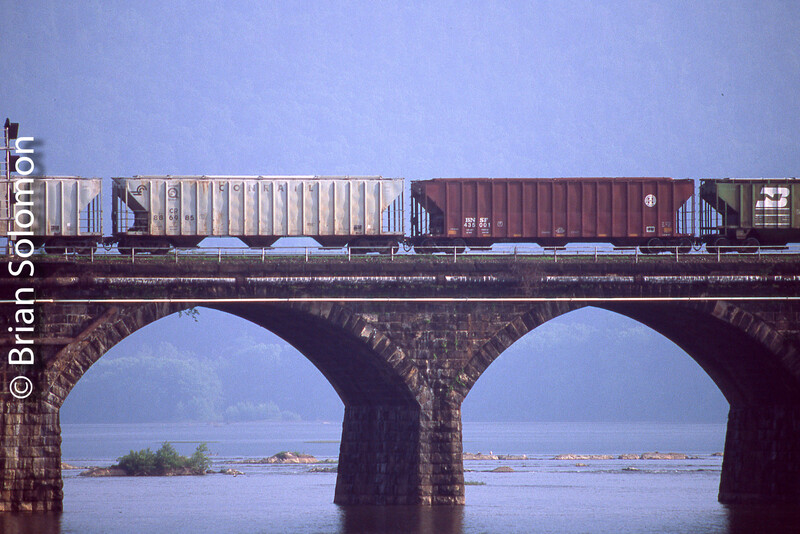 Three bay hoppers cross Pennsylvania’s Rockville Bridge in summer of 2009. Exposed on Provia 100F with a Canon EOS3 and 100-400mm lens. 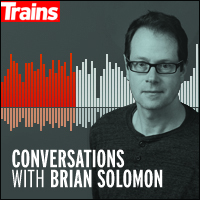 Conversations with Brian Solomon; Trains Magazine Audio Podcasts. 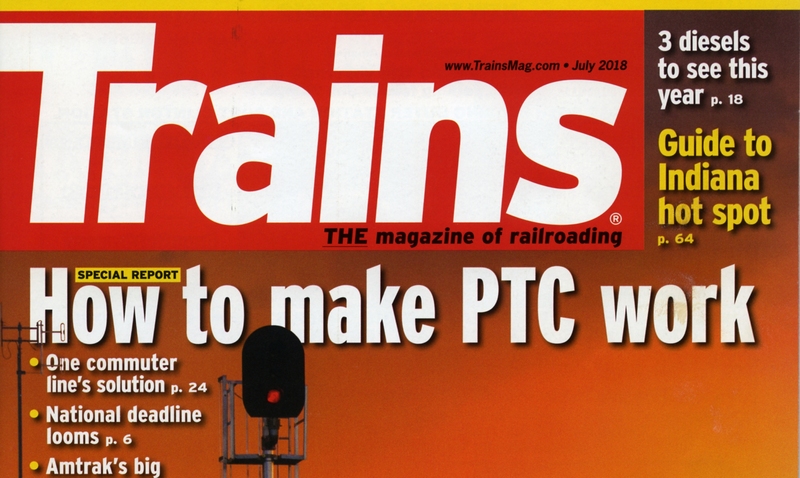 Although only partially related to my photographic work, I thought that Tracking the Light readers might be interested to learn that I’m conducting a series of audio podcasts with Trains Magazine. Over the coming weeks and months, I’ll be interviewing and discussing railroads with a variety of knowledgeable and interesting people, including active and retired railroaders, tourist railroad operators, railroad activists, and a few well known railroad enthusiasts and railroad publishing professionals. Among my first conversations was with John Gruber about his latest book: Beebe & Clegg—Their Enduring Legacy. My hope is to allow my guests expertise and perspectives to entertain and inform my listeners and enable all of us a great appreciation and understand of railroad topics ranging from freight cars and locomotives, signals, stations and short lines to how to avoid snakes while making photos. A new Podcast will be released every two weeks. My aim is to keep these to between 16 and 20 minutes. In August 2018, I made this 12mm view at Kalmbach’s sound studio during recording sessions. 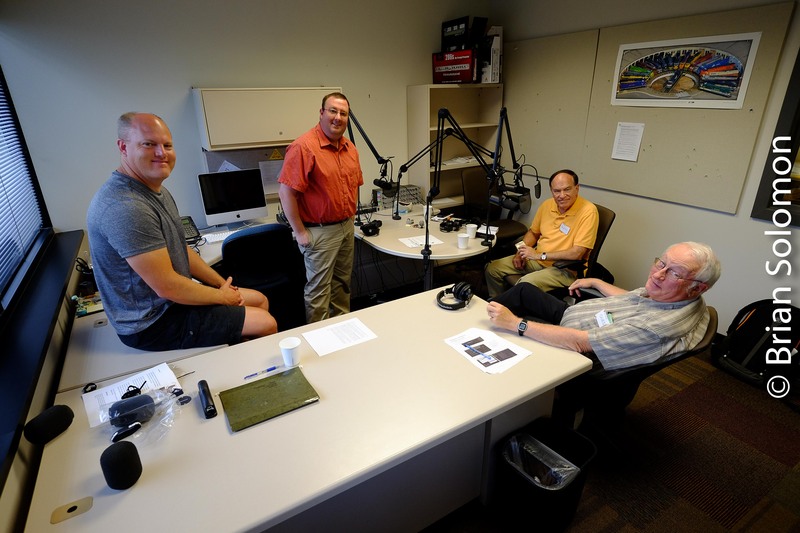 My guests include Chris Guss, TRAINS Brian Schmidt, Bob Johnston, and Craig Willett. 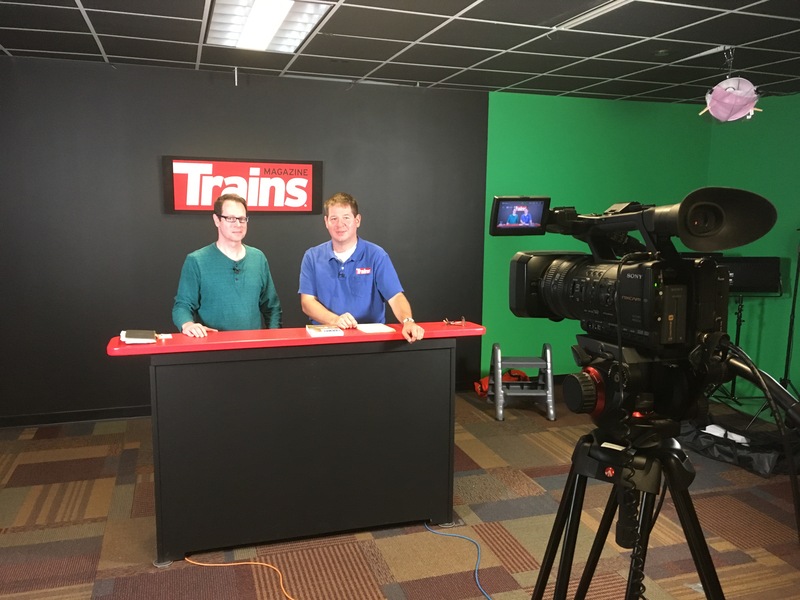 Yesterday, August 3, 2018, I was invited by Trains Magazine’s Steve Sweeney to co-host the weekly recorded News Wire video program. This was a thrill and an honor. Thanks to Steve and Kalmbach’s Diane for the broadcast! Brian Solomon and Steve Sweeney preparing to broadcast on August 3, 2018. Tracking the Light EXTRA: Author’s Advance of July Trains! My author’s advanced copy of the July 2018 Trains has been eagerly awaited. July 2018 Trains will be available soon! In addition to my monthly column, I authored and illustrated two large feature articles. The first is a detailed nuts and bolts discussion on Positive Train Control signaling, the second a travel guide to one of my favorite places: Germany’s Rhein. I’m extremely pleased with how both stories turned out. Special thanks to my hosts at SEPTA for allowing me to better understand the intricacies of their modern signaling. 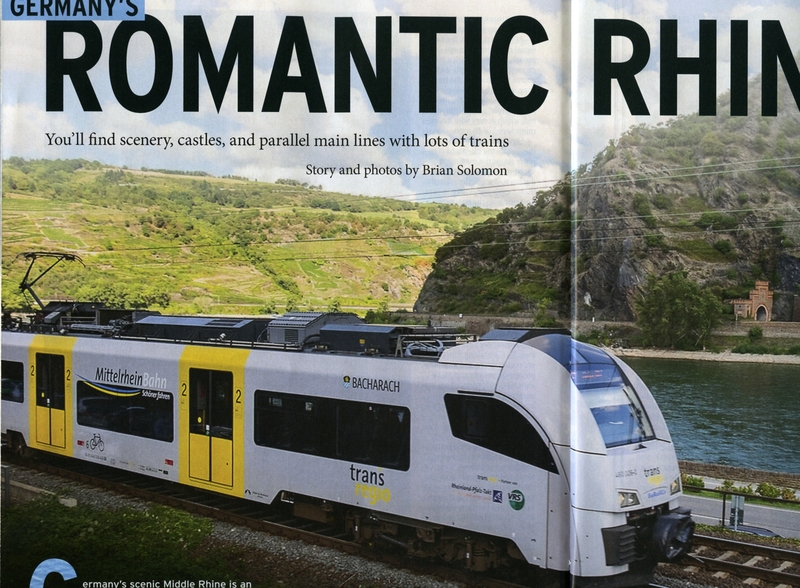 And thanks to everyone at Trains Magazine for bringing these stories to print! 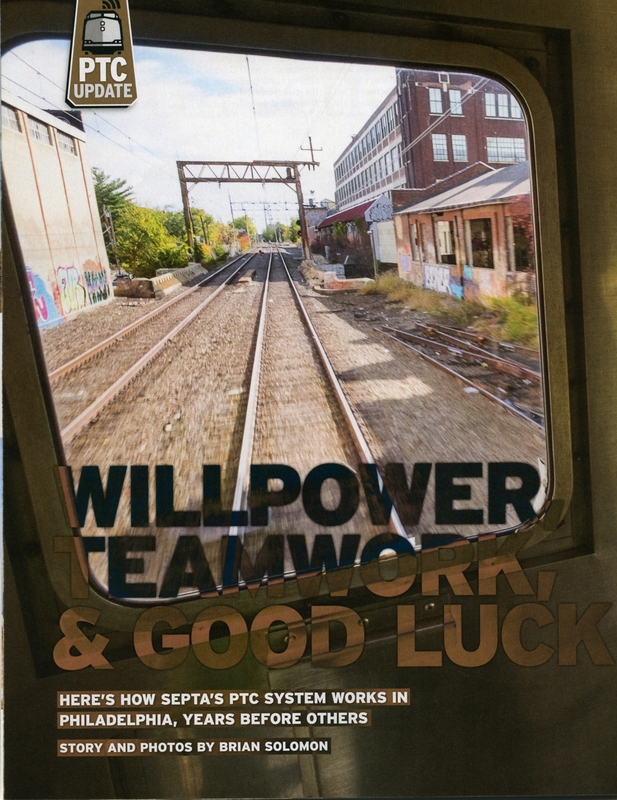 My SEPTA PTC story starts on page 24, this is half of the opening spread that spans two pages. Exposed using my FujiFilm X-T1 with 12mm Zeiss lens. Travel down the Rhine beginning with my two page opener on pages 34-35. Can you guess which photo(s) in this feature were exposed on film and which are digital? Brian Solomon’s Railway Guide to Europe is available from the Kalmbach Hobby Store. 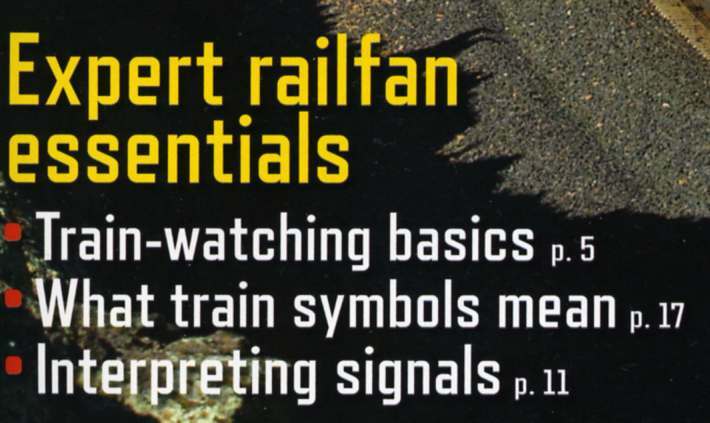 Trains Magazine’s special issue ‘Hot Spots’ with my article on interpreting railroad signals is on sale at Easons on O’Connell Street in Dublin. I exposed the lead photo at DeKalb, Illinois on a March morning 23 years ago using a Nikkormat FTN loaded with Fujichrome. 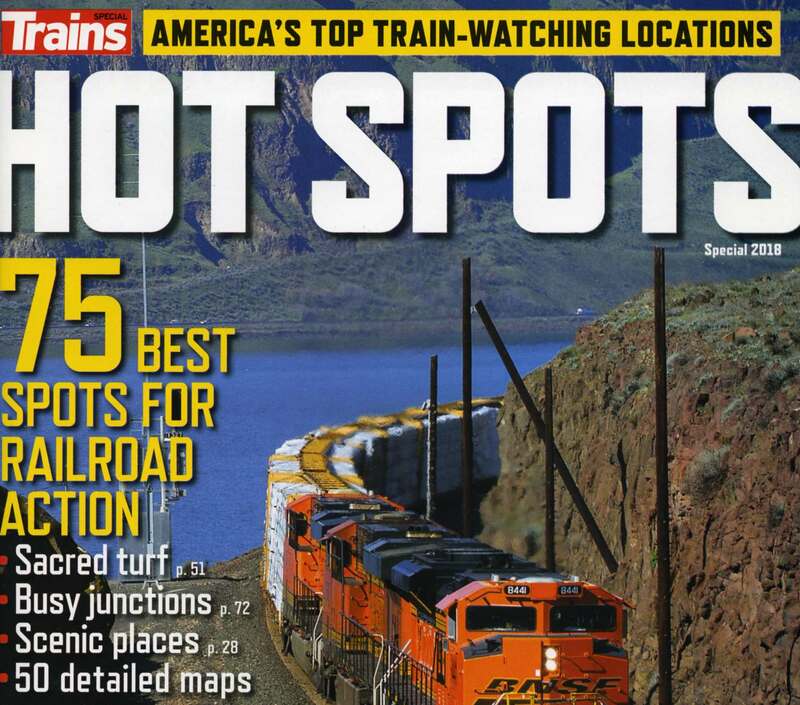 Advance Copy of Trains’ Hot Spots features my signals article. The other day I got a nice surprise. My author’s Advance Copy of Trains’ Hot Spots arrived in the post box. (mail box). I like advance sections of Trains. Something special. Something Extra. Just like in olden times with timetable and train order rules. Gotta love that! 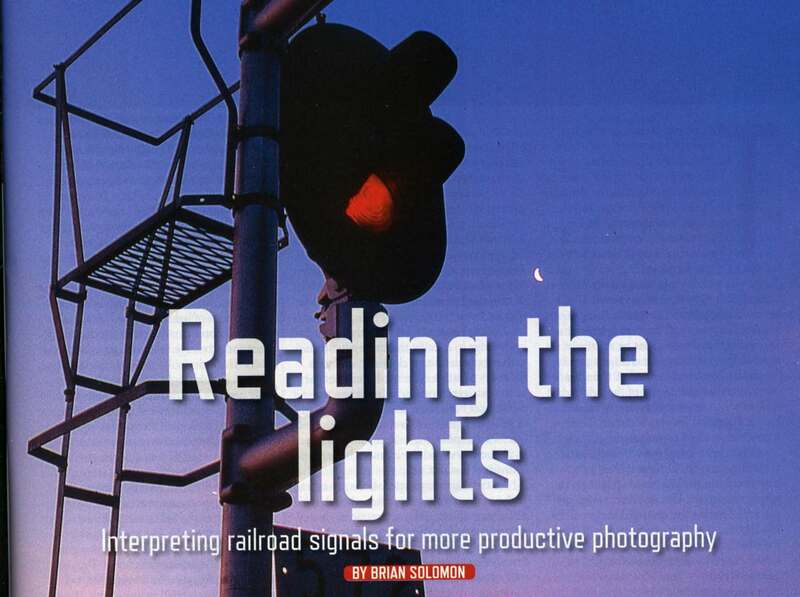 Check out my article on page 11, ‘Reading the Lights,’ about railroad signals. Look for this cover at media outlets near you! Tag line on the cover! That’s cool! Page 11, that’s me. Signaling enthusiasts will get the subtle humor in this photo. Rome: Nice Light and Colorful Trains. A couple of weeks ago I made these views of some colorful Trenitalia trains at Roma Termini. Bright Mediterranean light is pleasant to work with. In this situation I’ve taken the classic approach with the sun over my left shoulder. It was nice to have some interesting, yet static subjects to work with. I made several digital views with my Lumix LX7, but also exposed some 35mm color slides on Fujichrome Provia. These are the digital images. We’ll need to wait to see how the slides turned out. Notice my placement of the shadows in the scene. Check out pages 16-17 of the August 2017 Trains Magazine. I take a look at Italian Railways. Notice that the Italian State Railways ridership is nearly 20 times that of Amtrak! And they are aiming to grow their business and market share through massive investment. Taking the train is part of the experience. Ride a line once, and it’s an adventure! Ride the line every day and it can become drudgery. In June, I made an adventure of riding NJ Transit. My trip was thoroughly pleasant and without incident, except for my brief conversation with an unnecessarily surly NJT conductress at Secaucus, “The SIGN is over THERE!” (Gosh! Forgive me for neither knowing the routine nor how to interpret NJT’s train color coding on platform B). Ok ok, after all there’s a reputation to be maintained here, I understand. But, perhaps NJ Transit could take a few tips from the Belgian national railways when it comes to employee uniforms, customer service, and timetable planning. (All top marks for the SNCB based on my experiences). New York City as viewed from Secaucus. Meet on the Gladstone Branch. Probably not the cheapest ticket I ever bought, but an interesting routing none-the-less. Dual mode at Newark Pennsylvania Station. Top level of a bi-level car. Tracking the Light posts new and original content daily! Norfolk & Western steam in the 1950s as photographed by John E. Pickett. Dozens of John’s photos are featured in The Twilight of Steam. Peter A. Hansen has reviewed my book The Twilight of Steam on TRAINS Magazine’s Website. Special Christmas Post: Lionel Train Circles the Tree. Happy Christmas from Tracking the Light! In this classic scene, my old Lionel NW2 works a local freight as Thomasina-the-Cat oversees operations. Thomasina-the-Cat watches a Lionel NW2. Exposed with a Lumix LX3 using a mix of natural and incandescent light; f2.2 at 1/8th of second, ISO 200, auto white balance, manual focus. Thomasina doesn’t know much about Christmas but she loves to watch the train. Cold, Holiday Lights, and Trains. New England Central’s local freight with locomotive 3015 idles in front of the Palmer Yard (Massachusetts) office. I exposed several images, this one was at about 15 seconds. The other night in Palmer, Massachusetts an arctic breeze was blowing, but that didn’t stop me from making time exposures to capture the holiday spirit. I exposed these photos despite numb hands and cold feet. I used my Lumix LX-3 (choice night camera in cold weather) fitted to a large Bogen tripod. Years ago, I fitted plastic-foam pipe insulation to the tripod legs (as per recommendation by experienced cold-weather photographer Mike Gardner). This makes it easier to handle the tripod when it’s very cold. My exposures varied from about 1.6 seconds at f2.8 (ISO 200) to 25 seconds at f4.0 (ISO80). I set the camera manually using the histogram from test exposures to gauge my settings. Christmas lights on dark nights make for exceptionally difficult contrast. If you overexpose to allow good shadow detail the lights get blown out (losing their color[s] as a result). Underexpose to feature the lights and the sky and shadows turn to an inky black. Somewhere in between is a compromised setting. Rather than ponder the subtleties of the histogram as the blood in my toes congealed, I opted to take a series of images, one after the other, and select the best of the bunch in a warm environment later on. Palmer’s star railroad themed restaurant is the Steaming Tender; this has been colorfully decorated with holiday lights. I made a series of exposures from several angles. This one was exposed correctly for the lights and looked good in the histogram, but appears too dark in my opinion. I prefer the image below. This is about one stop brighter. While I feel it looks better overall, one noticeable flaw is that the ‘Steaming Tender’ sign is overexposed and the lettering isn’t readable. Ultimately the solution may be to blend two images of different exposures in post processing, but I’ve not bothered to do that yet. New England Central’s 3015 pauses in the yard for a 25 second time exposure. I wonder if the car adds an element of interest to the photo? If not now, maybe in years to come. Lumix LX3 photo. Looking toward CP83 (interlocking at the west end of Palmer) and the old Union Station (now the ever-popular Steaming Tender restaurant). A westward CSX intermodal train from Worcester is gliding through the scene. I exposed this at about 5 seconds at ISO 200. It is about 1.5 stops ‘over exposed’ as per the camera meter, but by using a much lighter exposure I’ve captured the effect of the moonlit high clouds and textures of the snow. On the downside, some of the Christmas lights have blown out (become seriously overexposed). DAILY POST: Snow, Sub-Zero Temperatures, and Red Engines. A Civilized Way to Spend a Winter Holiday. Villach is in southern Austria near the Slovenia-border. Here the Tauern and Semmering routes converge; there’s several yards, a handsome old passenger station, some stunning scenery. To the south, lines again divide, with one route heading southwest toward Italy, and another south into Slovenia. There’s no shortage of trains. An OBB Taurus electric leads a northward freight at Villach, January 2006. A southward Taurus lettered for GySev glides alongside the northward freight on the other track. A southward freight near Villach against an Alpine backdrop. My fingers were numb when I made this image. An OBB diesel chortles under wire. This is a good thing, because while standing out on a freezing January 2006 morning, I was beginning to question the wisdom of making railway photographs. After several hours in the cold, I noticed the Austrian equivalent of a convenience store near tracks and this seemed inviting. Inside it was immaculately clean, warm, nicely decorated, and (most importantly) it was serving piping hot cups of chocolate and freshly baked pastries. Hooray! There was plenty of time to witness and photograph the Austrian Federal Railways after a thaw. Thinking up new ideas everyday takes a lot of effort, so today, I’ll rely on clichés and old ideas with a new twist to fill the gap. Pan Am’s EDPL (East Deerfield, Massachusetts to Plainville, Connecticut) rolls south on the Conn River Line near Hatfield on November 21, 2013. 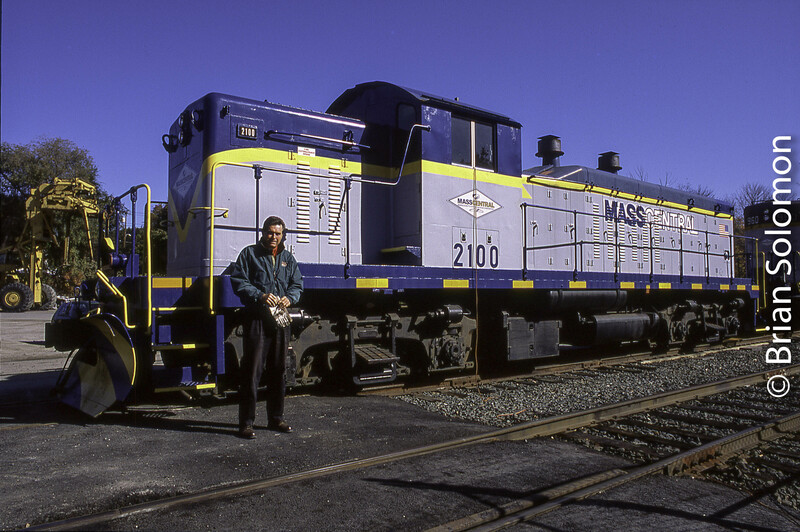 Back in the day, in the 1980s, I’d wander up to the Boston & Maine at East Deerfield where I’d photograph trains on well-worn rights-of-way led by first and second generation EMDs. I was thrilled to find freight trains on the move! The poor ‘ol B&M had seen better days. New England had been in industrial decline since World War I. It was my understanding that the old phrase ‘it’s gone south,’—meaning ‘it’s gone to the dogs’—originated when New England’s textile industries began closing and heading to the Carolinas and Georgia. (Never mind Southeast Asia, China and what not). Guilford Transportation came about and melded Maine Central with B&M and briefly with D&H. For a few years the railroad was really busy. Traffic was on the upswing, new intermodal trains were introduced, and run-through locomotives from D&H, Maine Central, as well as Norfolk & Western/Norfolk Southern became common. Then a souring passed over the scene. ‘All that glitters is not gold’, as they say (paraphrasing an English poet), and the well-trodden paths to the Hoosac Tunnel and along the Connecticut quieted for a time. Things changed again with the dissolution of Conrail. Now Guilford is Pan American Railways and Pan Am Southern. Metallic blue paint has begun to replace charcoal and orange. And traffic is on the rise. Yet to me, while there’s been some changes, the old B&M is a throwback to another time. Yes, there’s a few new signals, some new welded rail here and there, and some nice fresh ties. Many of the old searchlight signals and signal bridges are gone and here and there the tracks have been trimmed back. But the B&M has the appearance of retro railroad. It’s like classic rock with spin. Last week, on November 21, 2013, my old friend Paul Goewey and I went up to East Deerfield. It was like old times. First and second generation EMD diesels were moving freight in every direction while decaying vestiges of New England industry could still be found at every turn. Just sayin’ it seems to me that at the end of the day, it is what it is, and MORE! Paul Goewey snaps Pan Am’s MOED (Mohawk Yard to East Deerfield) crossing an early 20th century span in Greenfield, Massachusetts. Lumix LX3 photo. Greenfield, Massachusetts. Canon EOS 7D with 100mm lens. These old diesels are the same age as me! (more or less). MOED crawls through Greenfield. The old signal bridges are fading fast. I find the sound of 645 diesels, old bridges and vine-covered bricks in low autumnal light stirs nostalgia within me. Back in the day I was delighted to find old B&M EMD diesels wearing pre-McGinnis maroon and yellow paint. That was 30 years ago! The East Deerfield hump set on the Connecticut River Bridge, November 21, 2013. Maine Central 507 leads a short eastward freight across the Connecticut River. Pan Am’s ED2 departs East Deerfield for points north on the Connecticut River Line. North of Greenfield, ED2 grinds along on its northward plod. New rail and ties are being installed on this line and soon trains will be zipping along. Just like the old days when ‘the Boot’ (for Bootlegger) connected Washington D.C. and Montreal. (Amtrak’s Montrealer). Like, man, its all coming back! Brian Solomon and John Gruber Stop by at TRAINS. Last week, John Gruber and I called into TRAINS Magazine for a social visit. John has been a regular visitor at TRAINS since David P. Morgan was editor. I’ve been calling by since 1994. We pre-arranged for the visit during a conversation at Beecherfest. TRAINS’ Matt Van Hattem met us inside Kalmbach’s glassy office building and we spent an hour chatting with the magazine’s editors. Editor in chief, Jim Wrinn was away on assignment in California where he was on a live-feed covering the pending movement of Union Pacific Big Boy 4014. For me, railway photography has always been more than just images of tracks and trains, and I brought my Lumix into this inner publishing sanctum to make a few photos of the people that produce America’s most popular railway magazines. Angela watches the live feed from California to keep pace with the Big Boy. It was near the end of a hard day editing. John Gruber and Matt Van Hattem. John Gruber and Kevin Keefe. Trains staff watching Editor Jim Wrinn in California with the latest on the Big Boy. Friday evening July 12, 2013 represented my latest opportunity to watch and photography trains after sundown as this familiar location. In previous posts I’ve outlined my connections to Palmer (see: Palmer, Massachusetts, Friday Night, June 28, 2013, also Foggy Night in Palmer 28 Years Ago . . ., and Drowning the Light. A headlight illuminates freight cars at New England Central’s Palmer Yard on Friday July 12, 2013. Lumix LX3 photo. Although Palmer is a relatively small town, it has long been the focus of railway activity. Today, it hosts yards for both New England Central and CSX, as well as nominal terminal facilities for Mass-Central. CSX has a four-mile dispatchers controlled siding the runs from CP79 to CP83 (the numbers are based loosely interpret mileage from South Station, Boston). Just past the west switch at CP83 is the level crossing with New England Central—colloquially known as the Palmer Diamond. The popular Steaming Tender restaurant occupies the old Union Station between the two lines. New England Central home signal at the ‘Palmer Diamond’ on July 12, 2013. Lumix LX3 photo. New England Central 606 heading north across CSX’s former Boston & Albany main line. Lumix LX3 photo. After 10pm, trains converged on CP83. A CSX westbound on the main track met an eastward freight running via the controlled siding, as New England Central’s northward job 606 was looking to cross CSX to double its train together before heading toward Vermont. The awkward nature of the former Central Vermont yard at Palmer complicates operations over the CSX diamond. Not only is the yard too short to hold long trains, but the yard was built on a grade which crests at the CSX (former Boston & Albany crossing). A CSX westward freight holds at CP83 as New England Central 606 heads north. The Steaming Tender is located in the old Palmer Union Station. Lumix LX3 photo. Challenges for railroaders produce opportunities for photography, especially in the evening hours. As the railroads weaved their trains through Palmer, I made a series of photos. However, time was catching me up: I’d had a long day and by 11pm, I needed a bit of that elusive commodity—sleep. As Bob Buck would have said, I was the ‘hero’, and departed as more trains were focused on Palmer. The approach lit signals at CP83 were still lit when I hit the road. The regular gang can report on what I missed! Looking Back on Irish Rail. Fifteen years ago today, I exposed this image of Irish Rail’s empty Ammonia train at on the South Eastern route Bray Head (former Dublin & South Eastern Railway, nee Dublin, Wicklow & Wexford Railway). Irish Rail empty ammonia works around Brayhead, County Wicklow. Exposed on Fuji Sensia 100 with a Nikon F3T fitted with an f2.8 135mm lens. Exposed calculated manually with a Sekonic Studio Deluxe handheld light meter. At that time, there were three daily ammonia trains between Marino Point, County Cork and Shelton Abbey near Arklow, County Wicklow. The trains operated to tight schedules and were among the most predictable freight trains on the Irish Rail network. For me the Ammonia was a bonus. I was actually out for a Railway Preservation Society Ireland (RPSI) steam special running with engine 461. To make the most of the morning, I taken the first southward Dublin Area Rapid Transit (DART) run from Pearse Station (Dublin) to Bray, then walked roughly two miles to this location in anticipation of catching the regular passenger trains and the empty Ammonia. The line itself was in transition. If you look carefully, you’ll see the electrification masts along the line, as Irish Rail was preparing for extension of DART services to Greystones (the next station south of Bray). The run around Bray Head is one of the most scenic on Irish Rail. Here the line clings to cliff and passes through several tunnels all the while in view of the vast expanse of the Irish Sea. It was my first July 4th outside of North America. Irish Rail’s ammonia traffic ceased in 2002, when the fertilizer factory at Shelton Abbey closed. Today there’s no regular freight traffic on the South Eastern route. PKP 2-10-0 catches the light in April 2002. Exposed using a Nikon F3T with 24mm lens and R2 red filter on Fuji Neopan 400, and processed in Agfa Rodinal Special. As I mentioned in Polish Steam Working Disused Track (Published on March 6, 2013), eleven years ago I rode a enthusiast’s excursion from Wolsztyn to Zagan in south eastern Poland led by PKP (Polish National Railways) 2-10-0 Ty3-2. This trip covered a variety of disused lines southwest of the Wolsztyn steam depot. On that day, the train stopped more than 25 times for photography. This image was made near the end of the run. We were at a remote spot, not far from Zagan. The track was fairly derelict. After we got off, the train pulled ahead making for some nice effluence from the engine. Spring was in bloom and I framed the World War II-era 2-10-0 in the blossoming branches of a hedge. Mixed Pair Near Foxford, County Mayo. On the afternoon of September 3, 2005, I made this photo of vintage General Motors diesels working Irish Rail’s Ballina Branch train. The train was working from its connection at Manulla Junction to the north-end of the branch at Ballina. While mixed pairs of class 121 and class 141/181 diesels wasn’t unheard of, by 2005 it was a rare event. Irish Rail’s 071 class General Motors diesels were more common. Nikon F3 fitted with a Tokina 400mm f5.6 lens, exposed on Fuji Sensia 100 slide film. Tracking the Light posts new material every morning. Today, the branch passenger service is the domain of railcars. Gone too are the old steam heated Cravens carriages. Exposed with Nikon F3 fitted with a Nikkor f2.8 24mm. Fuji Sensia 100 slide film. I was working with a pair of Nikon F3s (my old F3T and a F3HP). On one I had a Tokina 400mm lens, on the other a Nikkor f2.8 24mm. Both photographs were exposed on Fuji Sensia 100 slide film and scanned. I’ll be presenting my illustrated talk “Ireland through American Eyes 1998-2008 My first Decade in Ireland” to the London area Irish Railway Record Society this evening (April 18, 2013) at 7pm, .